My spring semester has started with school, and I'm intimidated. I'm just taking two classes again, but it's going to be a LOT of work. Reading, yes, to be expected, but lots of writing this semester, too. But I'll make it! Taking a break from reading some fabulous Eudora Welty stories for class, I love scanning CL. It's like thrift store shopping when I don't have time to actually go thrifting. Since I'm not in a position to actually buy anything, I'm posting some of my favorites. :) Enjoy! This Welbilt range is right near me in North Decatur. Only $100! It doesn't mention whether or not it works... It would almost be worth it even if it didn't... 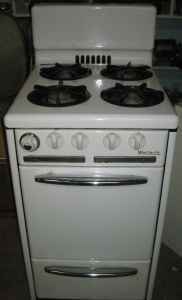 Except we actually cook these days. 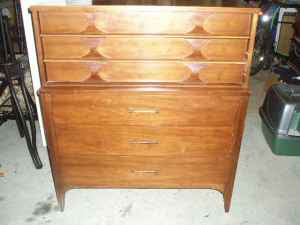 This is listed as a 1952 Kent Coffey Highboy Dresser. I love ads like these, where they clearly love the piece, but never once use the phrase "mid-century modern" or "Eames era." It's listed at $110. This piece is not a diamond in the rough. It's a diamond, but the owner knows it. 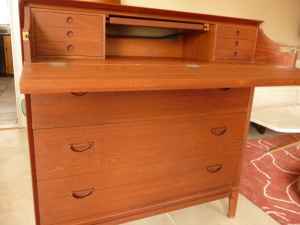 :) It's listed at $600, but claims to be a Peter Hvidt design. It's beautiful. Look at the edges! 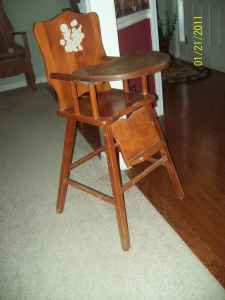 I love these vintage high chairs. I just always worry about the safety... This is only $25! I love the image on the chair back. This might be one of my favorites. 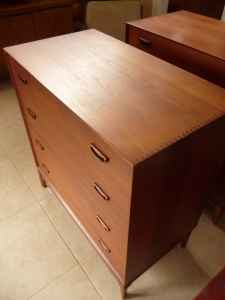 It's described as a toybox, and I just love the shape and colors. It reminds me of a carnival. But in my opinion, it's too expensive. $50? I don't know. I guess in a booth it would be that much. Either way, it's adorable, right? I will point out that it's been up for a while, and keeps getting re-listed but with no price drop. Take a hint? Love the Peter Hvidt! It's such a beautiful thing. I've been doing a lot of eBaying lately too. I'll get on in an eBay buying frenzy till I burn out, and then I'll ignore it for a while. Glad you're OK and were just busy with school. Isn't it gorgeous?! The ad described it as modular, and I'm not totally sure what that refers to, but this is definitely a lovely piece. I've gone through ebay phases, too, but only with tiny cheapy things. :) I've been spending a lot of time window shopping on Etsy... there are so many sellers who have these gorgeous and wonderfully photographed shops, it's like looking at little curated collections. And thanks for checking on me! Things have been a little crazy around here. We had the ice storm where we were snowed in for almost a week, and then school started. Not too much happening to blog about. :) Hope you are well! Where can I get that elephant? Seriously, I have been lookng for this for awhile now, please le tm eknow if you still have it. I will check back for a response and will give you contact info if it is still available. Thanks! 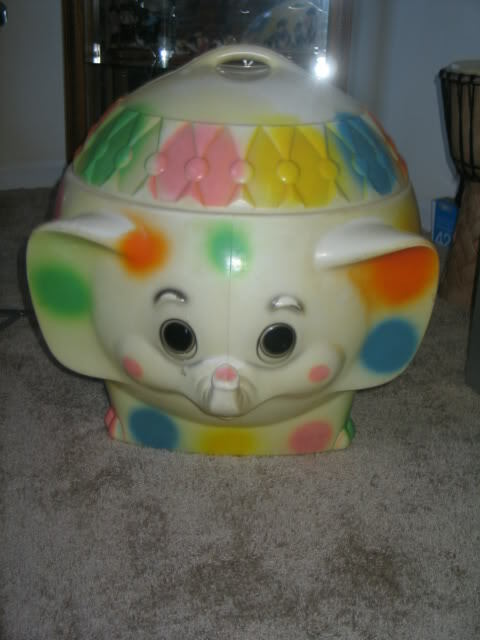 I have a blue elephant toy chest I am wondering about. I only see polka dotted pics online.